Studio mic for male and female vocals, acoustic instruments, percussion, strings and more. Bottle isn’t just a microphone. 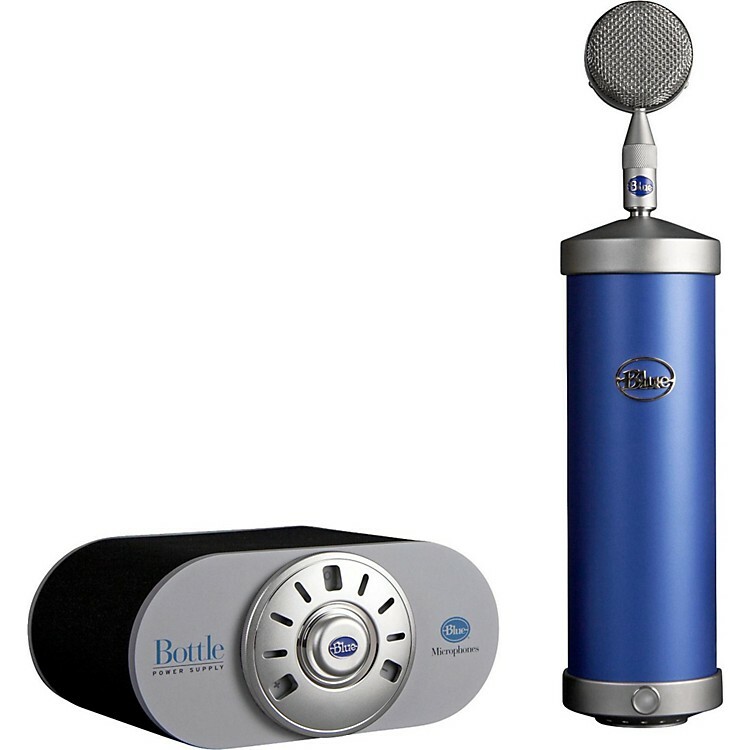 It’s a complete microphone system that features nine interchangeable mic capsules. Each of these nine Bottle Caps delivers a distinct pickup pattern and tonal characteristic to suit any instrument, vocalist, ensemble, or recording style. Bottle’s simple bayonet-mount lets you swap between capsules without turning off the power supply so you can experiment with new sounds or layer tracks for lush sonic textures instantly. This package includes the Blue Bottle along with its full complement of capsules and a rugged SKB carrying case. Bottle’s internal circuitry features a fully discrete Class A tube circuit powered by a hand-selected EF86 pentode vacuum tube in triode mode for distinctive warmth and saturation. The hand-wound transformer delivers precision and accuracy due to the high conductivity that silver offers. Bottle utilizes highest quality electronic components with no pad or low-cut filter switches in the microphone circuit, allowing the highest possible quality signal path. Every Bottle microphone comes with the B6 large-diaphragm dual-backplate cardioid capsule. B6 holds the honored title of the “Blue Standard” and delivers larger than life sound with enhanced lows and extended high frequency response. It’s the ideal capsule for recording lead and background vocals, percussion, and guitars—all with detailed sonic dimension and character. The Power Stream is more than a precision-engineered power supply that delivers clean, extremely consistent power to the Bottle. It’s also an innovative and creative tool for fine-tuning the Bottle’s sound. Both the heater and the plate voltages are ultra-stable and non-dependent on AC changes of fluctuations. For AC rectification, the Power Stream uses only high-frequency diodes to obtain the purest DC possible. And most importantly, the plate voltage supply is of low impedance, which improves sonics and clarity. All the potentiometer switches on the Power Stream are discrete military grade with enclosed contacts. The Power Stream offers a nine-step sensitivity knob that allows you to determine precisely the right polarization voltage to achieve your desired sound. Rotate the switch counter-clockwise to tame an edgy sound source. Or rotate clockwise to increase the sensitivity and drive the capsule harder to add vibrancy and richness to quieter performers. Each of the Bottle Caps respond differently to the various sensitivity settings, so when combined, the Bottle takes on a nearly infinite sonic palette. With a range of minus 6dB to plus 4dB of sensitivity, the 9 positions offer an opportunity to dial in the sweet spot and customize the sound of the Bottle to perfectly capture the unique sonics and character of your vocalist or instrument. Order today. This mic system will satisfy most every imaginable need. If you seek a single m,microphone purchase for your studio, this is probably the one.